The number of mobile phone users that use the Opera Mini browser has topped 200 million per month for the first time, that’s up 47 percent from last year, the Norwegian company has today revealed. Launching its latest State of the Mobile Web report that looks at usage of its products across 53 countries, Opera revealed that it passed the landmark in June 2012. 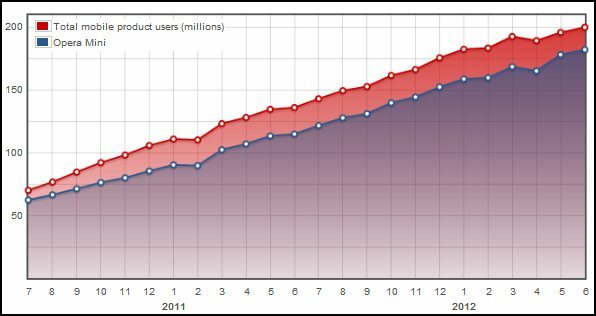 Of the 200 million user figure, the Opera Mini browser (for feature phones) accounts for some 92 percent of users (183 million users) with Opera Mobile (for smartphones) picking up the remaining 17 million. It isn’t just users that are significantly up, as Opera — a reported acquisition target for Facebook — reveals that page views increased 55 percent annually, as users perused more than 115 billion pages from their devices in June. Opera is famed for its data compression technology, which is particularly appealing for pre-pay mobile users, who are billed based on their data usage. The Norwegian firm says it served up more than 2,015 million MB of data, up 88 percent from 2012. Impressively, that data figure from last month would have been 90 percent higher (beyond 20 petabytes for those that can count data) were it not for the data compression, the company claims. The report itself has plenty of focus on Opera’s growth in Africa, where it has noticed a number of telling signs that illustrate that mobile Web usage is growing in sophistication, as much as usage. 25 out of 53 countries (47 percent) have international news sites as the most popular news source. Countries include Republic of Congo, Sierra Leone, Egypt, Libya and Côte d’Ivoire. 18 of those 25 countries turn to the BBC as the most-used source. In the year since the revolution, Libya has grown the most in every category of Opera Mini usage, including users, page views and data consumption. The number of Opera Mini users in Côte d’Ivoire also rose 600% in one year. Page views grew 744%, meaning people are browsing more pages than they did the year before. Data use grew 760%, outpacing the growth in page views. Across Africa, data growth seems to outpace page-view growth, suggesting that Africans are browsing larger pages and most likely, using richer, more advanced websites. CEO Lars Boilesen, well known for colorful and insightful comments, likened Opera’s mobile products to a school, which is particularly apt in Africa and other emerging markets. For many of [the 200 million users], a browser is more than a tool to ‘browse the web’. Sometimes it’s a school when you can afford none, sometimes it’s the only line to an outside world shut off by an oppressive regime. Providing a service that reliably and cheaply delivers critical information to just about everyone with a phone is the reason Opera makes browsers. We want to make a difference in the world, not only on the web. Regardless of talk of Facebook’s interest, which has notably died down somewhat, Boilesen’s ‘we want to change the world’ mentality sounds much like something that we’d hear from the Menlo Park-based social networking company. Ideologies aside, the fact that Opera has such a strong user base worldwide — particularly in emerging markets were social networks uptake remains nascent and predominantly on mobile — this report and Opera’s reach is a further reminder of why Mark Zuckerberg may be keeping his eye on the company. Opera’s efforts are driven by its distribution deals with handset makers and telecom providers, particularly in Africa, Latin America and Asia. To that point, the company recently teamed up with America Movil and Bharti Airtel, which boast a combined 500 million global subscribers and are big across those three continent. Despite the impressive growth and user haul, March saw Android Robot overtake Opera as the world’s most used mobile browser.